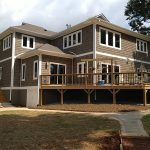 The weather here in Huntersville, North Carolina is pleasant throughout much of the year, but if your backyard design isn’t very functional or appealing, you’re probably not taking advantage of the climate. A beautiful and well-landscaped backyard can transform the feel of your property, offering a place to rest and relax with your loved ones. When you have kids at home, you can spend time outdoors and let them run around to get some of their energy out. Even without young children, a backyard can become an oasis for get-togethers with friends and family members. Knowing where to start in backyard design can feel very overwhelming, especially if you haven’t undertaken this type of task before. Luckily, you don’t have to go at it alone. Our experts at Chad Goodin Signature Homes can help create the perfect design for your backyard, creating a more functional space where you can enjoy time with your favorite people. No matter what you envision for your backyard, we can make your dreams come true. We can design and build outdoor kitchens that offer a place to prepare and cook meals, and then enjoy good food with your family and friends. We also provide luxurious additions like water features, which can help create an ambiance on your property, and swimming pools, where you can cool off on hot summer days. Our goal is to capture the vision you have for your backyard and design the space to fulfill all your wants and needs for the outdoor area.